The second bedroom / home office has come to be known as "The Batcave", mainly because it is the electronic nerve centre, containing Node 0 - the point at which all the CAT 5 and other cables are terminated in a 19 inch Rack. 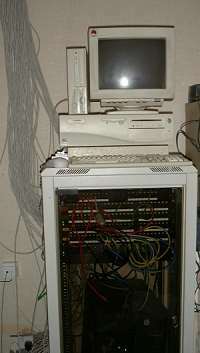 The ADSL link is in the Batcave, and this is connected to the Firewall, and then via the Ethernet Switch, patched into the home network. Additionally, the phone lines are patched into the CAT 5 cabling via patch panels in the 19 inch rack. There is also a third separate, independent security system just for the room. 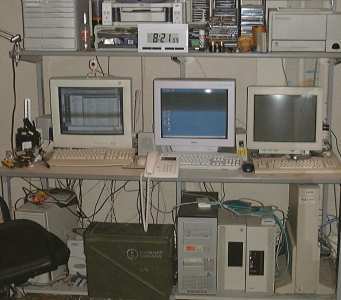 The reason for locating Node 0 in this room was that since the decision was made to use it as a home office and electronics lab as well as a spare bedroom, it would allow easy access to Node 0, as well as ensuring that Node 0 would be in a room with a fairly uniform temperature. As well as the main home office facility and an electronics lab, the room also doubles up as a spare bedroom. The room is actually only currently equipped with 12 CAT 5e network points fitted in groups of 4, in 3 double wall boxes. There will be at least one other double wall box with another 4 network points fitted at some point. As with the other rooms, these are used for distribution of phone, LAN and HAN points without having to trail wires everywhere. The video connection in the room is supplied by 1 UHF wall socket, although again, much of the video distribution in the house will eventually be carried by the CAT 5e network cable. Within the Batcave are 2 LM10U lamp modules and 2 AM10U appliance modules. With Node 0 located within this room, it was a no brainer decision to hook it up with a DS1820 temperature sensor. I have also started fitting a few more temperature sensors in the room, 1 for general room temperature monitoring, and the others for monitoring the temperature of various pieces of equipment. Current status is messy, but eminently workable. All the wiring is plumbed in, although again, visually, things are rather a mess at the moment, as can be seen from the following photographs. This is Node 0. Inside the 19" rack are 2 48-way patch panels (for the CAT 5 network cabling) and a 16-way patch panel (for patching the phone lines into different rooms). The patch panels were ordered from Lets Automate. As I have now discovered, you can never have enough patch panels, and I have more CAT 5 cables (104 at the last count, with at least another 12 to come) than I have patch panel connections. Also within the rack are a 24-way 10/100baseT Ethernet Switch, a 19" 1U rack bay for the unit to connect the Home Security System to a PC, and in the space underneath is a large database server that I am working on. Sat ontop is the Book PC Firewall, one of the home automation servers, and my Sun SPARCStation 1+ which is now probably going to wind up as a mailserver.